Another poll comes to completion, and we are lucky to have a total of 30 votes placed. That is a record so far, thanks to everyone who participated. I’m very impressed by the results. I’m not a big fan of the pot luck. I’m sure if we could get a group of chef friends together all willing to shell out a few bucks and the results would be fantastic. Unfortunately, Aunt Edna, Uncle Bob, and the neighbors three doors down all get involved. I’m not un-appreciative of their enthusiasm, just the quality of their output. But, from the looks of these poll results, if I was to invite my blog readers to pot luck, we would be very pleased. Where did the votes fall? Most people are looking to ‘wow’ us with their pot luck creation, and we sure can’t complain about that. A good number of individuals are born leaders and jump on the proteins, the bulk of any meal. There is always space on any pot luck for more protein. Man cannot live on macaroni salad alone….no matter how good it is. A few people would not hesitate to stick with what has worked in the past, and there is nothing wrong with this approach. If it ain’t broke, don’t try fix’n it. A very small majority of people, in fact only 2, would try pulling the wool over our eyes playing the old switch it out game with some of their dirty old dishes and store bought food. I don’t condemn this, if you can’t, don’t want to, or buy something really good, then go for it. 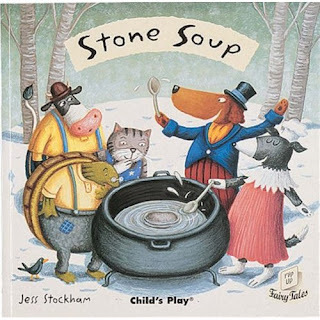 Lastly, stone soup! Stone soup is not a real dish, at least not in the way I intended it. Stone soup is something of a personal philosophy that cooperation among differing people will result in a greater good. The story of Stone Soup is a Grimm Brothers tale in which 3 travelers/soldiers are wondering the country side in search of nourishment. While not a single person in the city they come upon is willing to furnish them a meal, each person is willing to donate a small garnish to the pot of soup the travelers started by adding a stone to a pot, and offering the end product to the community as a whole. I like the idea of stone soup, it’s a romantic tale, it shows people have heart, a true love for each other. It’s got 1967 Haight-Ashbury written all over it. Everybody gives a little and you end up with a lot. No CEO bonus money, no buy-outs, no stimulus…no organic, no GMO, no E. coli….no interest rates, jobless rates, or rat race. A single person with a pot and a stone, yet in this day and age we’re worried he would hit us with the stone and put all our pot luck delicacies in his pot and run off. Excellent commentary! I like the idea of stone soup, but as I've seen at most potluck picnics I've had, we end up with four batches of macaroni salad. I'd be afraid that any stone soup I'd commission would be a stone and probably 8 different radishes -- luck seems to work out that way. Random question - have you ever used beet greens for a soup? Beet greens would work great in a soup, remember that red beet tops will turn things a rosey hue, golden not so much. As for root vegetable tops, about the only thing I can think of that I would shy away from is carrot tops, not funny, ha ha ha. No really, beets, turnips, kohlrabi, fennel tops are good chopped up too, along with your mustard greens and kale, shot even the radish tops left over from your stone soup are good. In fact I remember a few years back Wasabi Leaves where new on the scene, unfortunatly they had no radish flavor.